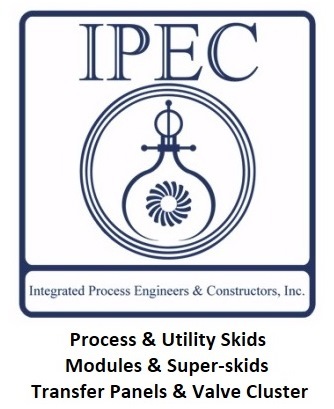 Integrated Process Engineers & Constructions, Inc., also known as IPEC, has been providing a wide range of custom modular process systems and components for the pharmaceutical, biotech, food, dairy, chemical, and biofuel industries since 1996. IPEC designs and fabricates complex systems from start to finish. CESCO was involved in a Media & Buffer Prep System project with IPEC for a large pharmaceutical company. Above are pictures of the final system during the Factory Acceptance Test. 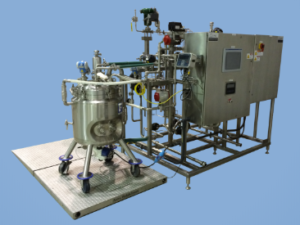 By utilizing flow meters, positive displacement pumps, control values, static mixers and other process sensors, IPEC is able to design and construct blending systems to incorporate ingredients into a continuous product stream. 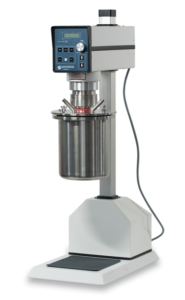 Ingredients can be supplied from totes or skid-mounted vessels while instrumentation and mechanical components work together to blend ingredients dynamically and accurately to user-defined ratios and production rates. 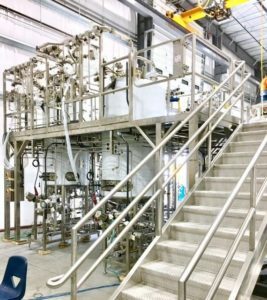 Integrated CIP capabilities, product recovery (pigging) systems, and alternating ingredient vessels (for continuous production) are available. IPEC recently delivered Ultrafiltration/Diafiltration (UF/DF) and Virus Filtration systems to a pharmaceutical client. The customer came to IPEC with desired production rates and preferred 3rd party filtration technologies, and asked that IPEC assist with process development.